Our “8th Avenue Tranquility” video is finally ready, and has now been exclusively premiered by Jazzwise magazine, London. Enjoy..! Thursday March 16th – Evan Parker meets KINETICS (Anderskov-Pultz-Vestergaard), Vortex, London, UK – 9pm. As of today, JazzDanmark has announced the line up for Sounds of Denmark; a 5 day festival in London in September, taking place at the acclaimed live venue – PizzaExpress Jazz Club in Soho. Jacob Anderskov’s RESONANCE is performing at PizzaExpress, Saturday September 16th, 2017. 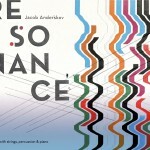 As some might have noted, the band, formerly known as “Strings, Percussion & Piano”, has been renamed RESONANCE. Jeg har tænkt på dig hvert minut i snart en uge nu. Det er ikke til at holde ud at du skulle væk så tidligt, at du ikke skal se børnene vokse op, at du ikke mere skal smile så unikt Nicolai’sk og forgylde musikken og universet overalt hvor du går. Vi spillede vores sidste koncert sammen kun en uge før du var væk. Alt hvad du spillede den aften står lysende klart i min erindring, du var i topform, generøs og ultranærværende som altid, og jeg vil aldrig glemme det. Den slags minder har du skabt mange af hos os alle, smukke minder som ingen kraft kan tage fra os som er tilbage, hvor sorgfuldt det end måtte være. Jeg har tænkt vanvittig meget på dine nærmeste, jeg føler med jer af hele mit hjerte og hele min sjæl. Tak Nicolai, for alt det som du nåede at give os, vi vil huske dig for evigt. Hvil i fred. In february 1917, the world’s first ever recording of Jazz music was made. Jacob Anderskov celebrates the Jazz Centennial in February 2017, with a series of 3 concerts with 3 different bands, in 3 days. The concerts will feature music from The Jazz Century, in vibrantly creative versions. Jacob Anderskov’s music has been described as “expanding the sonic language of Danish jazz” (Down Beat, 03, 2013), “constantly pushing the borders” (Jazzblog, dec 2106) even “seismographic” (JazzSpecial, June 2008), sensing Music’s tectonic changes early. However, Anderskov also has a deep love and passion for the jazz tradition, from the earliest jazz and up till today. This concert is a celebration of the entire history of Jazz, with a radical twist. It will be intense, dynamic and spiritual. It will be the soul of Jazz, as heard through a Modernist’s ears, and carried into the future. Jacob Anderskov (p), Karen Johanne Pedersen (vln), Mette Brandt (viola), Ida Nørholm (cello), Peter Bruun (d, perc). What Reason Could I Give/ Resonance/ 8th Avenue Tranquility/ Capone/ Alpha/ Impermanence II/ Portrait/ Open Society. _ Label: Sundance / Stunt. Release: September 2016.